Not too long ago, we delved into the tragicomic stagecraft of purchasing one's wedding dress, an emotional hunt that can potentially drag on for week after angsty week. But for the bride-to-be who's still spelunking through salons to no avail, great news: a "visionary artist and designer and bead sculptor" has created just the dress for you. For no apparent reason other than "just because," Minnesota woman Gail Be (who designed a headpiece worn by Lady Gaga) has spent over three years taking nearly one million beads and crafting them into a 400-pound gown. If you're going for dramatic effect, this number will certainly stun (or appall) your guests. Be describes the gown as a "work of art," and it indisputably is. She created the entire thing without a pattern; just she and 23 assistants chasing a sparkly dream. All beads, no fabric — it's like Rihanna's CFDA look on glam-meth. Unfortunately, the dress won't be considered for the Guinness Book of World Records, presumably as no official had a calendar with three years open to observe the entire process from beginning to end. "I kept going and going," Be said of the design, which has so far taken 20,000 hours to complete. "It's in my warehouse and when it finally got to the back I stopped and said, 'It's done,' and everyone got up and clapped." 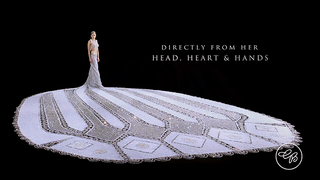 The dress boasts a 20.5-foot train constructed with seven miles of beading wire. The gown's train includes 500,000 glass pearls and over 400,000 crystals, including vintage Swarovski crystals, according to Be. The gown, which is a size 4, probably won't land on a civilian body; Be hopes that it will be worn by royalty or featured in a film. But unless that lucky lady is an experienced truck-puller, she shouldn't expect to actually walk down an aisle in this monster. Perhaps if she's willing to arrive at the altar in a makeshift float, it could work. Like Macy's Thanksgiving Parade for the one percent. Images via Gail Be and Good Morning America.